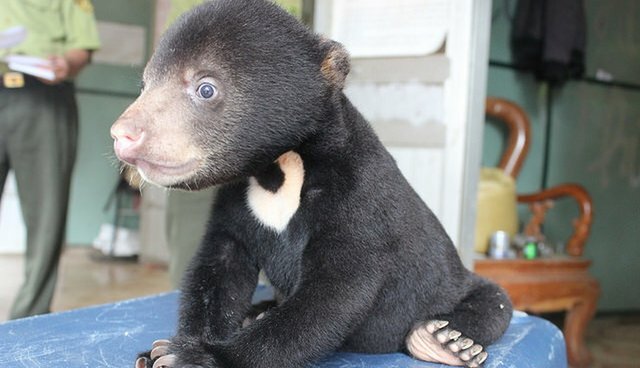 A wide-eyed, 3-month-old bear cub is now safe in a Vietnam sanctuary after being kidnapped from his mother in the wild. 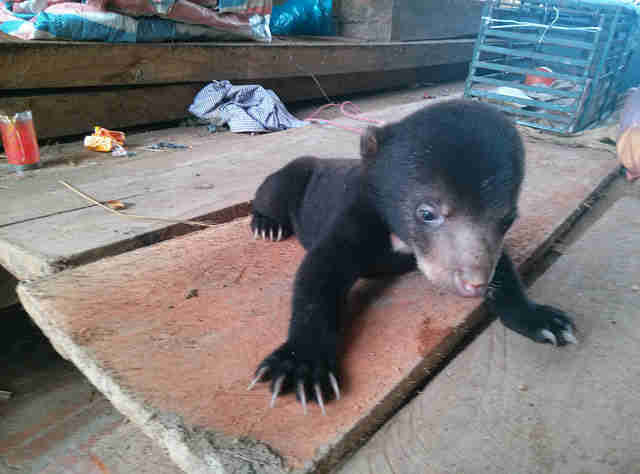 Another victim of the colossal, relentless wildlife trade, the tiny sun bear was discovered by local forest rangers two weeks ago in the Sop Cop district near the Vietnam-Laos border. 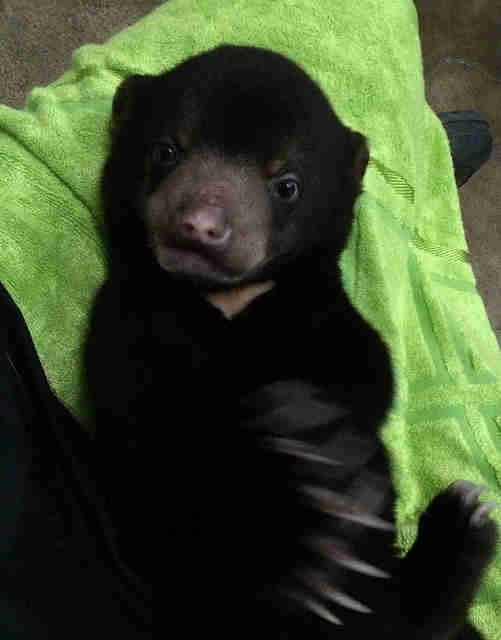 Last Friday, the 6-pound cub was transported to Animals Asia's Vietnam Bear Rescue Center. The group named him Murphy. Murphy was discovered in a backpack by Sop Cop authorities while they were pursuing his trafficker. 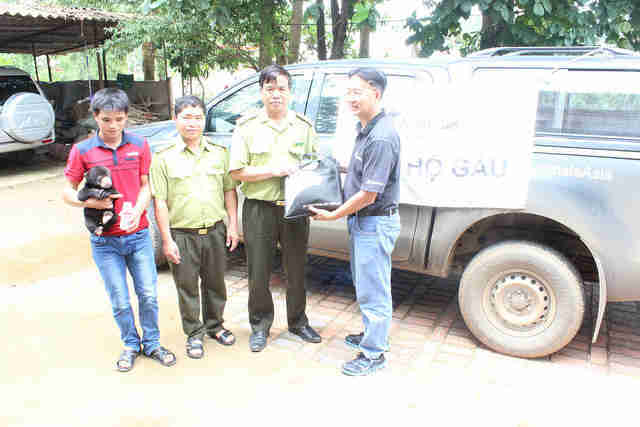 "As soon as the trafficker saw the rangers, he threw the backpack away and luckily it landed on soft ground," Tuan Bendixsen, director of Animals Asia in Vietnam, told The Dodo. The trafficker was later apprehended and confessed to murdering the cub's mother. The Sop Cop forest rangers told Animals Asia about the cub and cared for him until the organization's staff could retrieve him. In the interim period, Bendixsen says, Animals Asia explained to the rangers how to care for the animal and feed him milk formula. 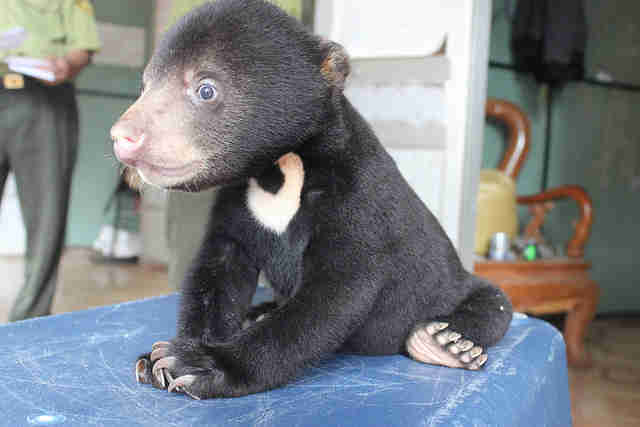 Because Murphy is an endangered species, and the police were pursuing a criminal case against the trafficker, the little bear remained with officials for a week. When he was finally brought to The Bear Rescue Center last Friday, Murphy was frightened by any sudden noise or movement, Bendixsen explains. In the wild, cubs often stay with their mothers for more than two years. Because the cub's mother was murdered, and he was kidnapped, "it's highly unlikely Murphy will be able to be released into the wild ... Murphy would not be as streetwise as cubs that were raised in the wild and probably would not survive in the forest." 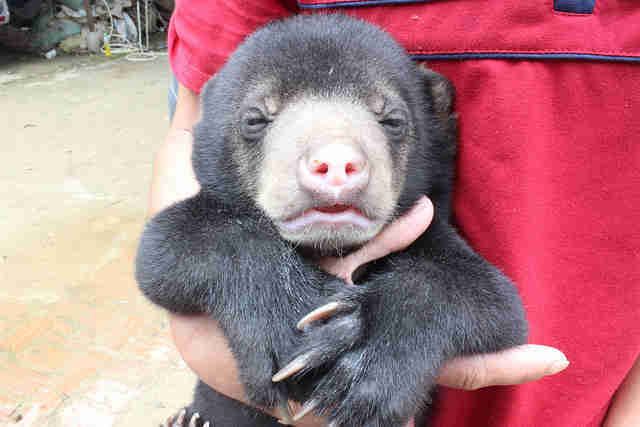 Bendixsen adds, "There isn't any known protected area in Vietnam that we can release bears like Murphy and guarantee that he will not be poached." Bendixsen says the trafficker likely stole Murphy so he could be shuttled through the grisly wildlife pet trade. But as he matured and grew, he may have landed in Vietnam's horrific bear bile farms, where some 1,245 moon and sun bears languish in a captive life of depravity and pain. Animals Asia has been advocating for all the bears in the Vietnam farms to be released. While they have rescued some of the bears, others are still waiting and often die before help arrives. 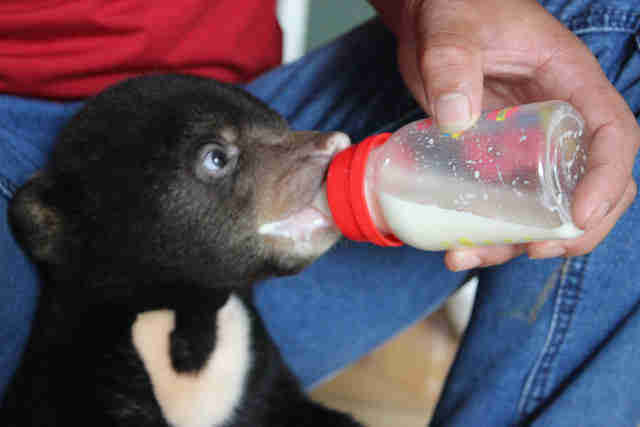 If you want to help Animals Asia care for bears like Murphy, you can donate here.